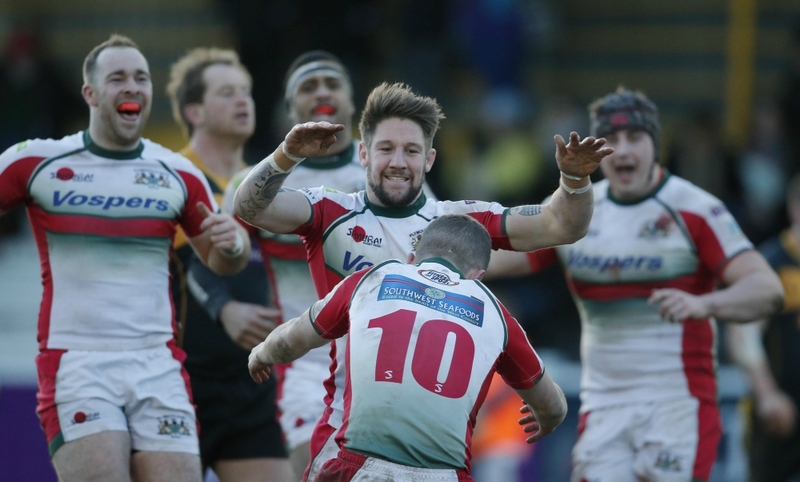 PLYMOUTH Albion have not enjoyed many trips to Esher over the years, but they certainly enjoyed this one. Graham Dawe’s side out-scored their hosts four tries to two to claim a bonus point win and move up to fourth in the National One table. Albion produced a very impressive display at Molesey Road. They defended brilliantly, scrummed well and were potent in attack. They have now won eight of their last nine matches and have secured bonus points in their last three as well. Supporters must be wondering just where they might be now if they hadn’t had a slow start to the season after bringing in a whole new squad following their relegation and the loss of more than 30 players. Matt Shepherd, playing at full-back after Ethan Ford was ruled out with injury late, claimed 20 of their 30 points on Saturday with two tries, two conversions and two penatlies. Albion’s other points came from joint top try scorers Herbie Stupple and Nile Dacres. It was Plymouth’s first win at Esher in six attempts. The Devon side were forced to make two late changes to their squad after full-back Ford and prop Dan Pullinger were ruled out with injuries. Ford had started every league match for Plymouth. In his absence, Shepherd moved to full-back with Harrison Cully taking over on the wing. Pullinger’s place on the bench went to Dean Brooker, while Robin Wedlake was also added to the replacements. Albion made an encouraging start and kept Esher in their half for the opening three minutes, but eventually Esher got going and the visitors really had to produce some great scramble defence to deny them on six minutes after Joe Brown and Andrew Garner broke the line. But it was the Devon side who got the first points on the board when Shepherd kicked a penalty on 13 minutes. Seven minutes later Esher equalised when fellow full-back Alastair Chisholm kicked one at the other end. There was not much to choose between the teams in the first half but on 27 minutes Albion claimed the first try of the contest. From a scrum on halfway, Stupple produced a great break. He then fed his back-row colleague Dacres, who was stopped just short of the line on the right. But Albion recycled well and switched it quickly to the left and there was Shepherd to go over. He also converted. That seemed to stir Esher into life and Albion had to defend really hard. Their defence was outstanding but just when it looked like the home side were not going to find any way through, free-scoring winger Spencer Sutherland managed to sneak through a gap to touch down. Chisholm converted to level the match. Just before the break the game boiled over when Albion were awarded a penalty five metres from the try line. Esher had scrum-half Garner sin-binned and from the penalty Albion opted for a scrum. It proved a good decision as from the set piece Stupple powered over from the base to score his ninth try of the season. Shepherd just missed the conversion but Albion led 15-10 at the break. Ed Holmes nearly scored straight after the interval. Esher lost the ball and he kicked forward. It looked like he was going to win the race for it but the ball hit the post and just diverted slightly away from his hands. Esher, though, were forced to ground the ball in the in-goal area, giving Albion a five-metre scrum. Albion then got two penalties and each time opted for another scrum. The referee warned Esher but did not give a penalty try. However, the visitors did get the try they were looking for when Dacres went over on the right for his ninth of the season. And it got better for Dawe’s side when Shepherd crossed for their fourth in the 52nd minute after some great passing and handling by Plymouth. Matavesi putting the final pass in for Shepherd, who also converted. Four minutes later, though, Matavesi was sin-binned for not retreating 10 metres at a penalty. But Albion, whose record league defeat came at Molesey Road, did not concede any points while he was off the field. In fact, they should have scored some. Shepherd missed a penalty in front of the posts on 67 minutes before Plymouth failed to convert a good break by Jake Murphy. Ironically, two minutes after Albion returned to 15 men, Esher scored a second try, which was again claimed by the speedy Sutherland. He just had too much pace down the left wing after an earlier good break by number eight Peter Synnott. That put Esher 12 points behind, but Shepherd kicked a penalty six minutes from time to put his side three scores up and seal the win and pay Esher back for their big win at Brickfields earlier in the season. Esher: A Chisholm, A Wright (P Olima 54), J Brown, T Williams, S Sutherland, M Wilson, A Garner (T Chalcraft 73), O Mines, C O’Connell (N Sweeney 50), C Zeiss (C Leigh 76), I Kench, O Marriott (C Gentles 50), S South, C Gossington, P Synnott. Albion: M Shepherd, T Bedford, J Murphy, M Koteczky, H Cully (E Bale 74), B Searle, C Setter, O Dawe, R Freestone, C Judge, D Collier, E Holmes, N Dacres, S Matavesi, H Stupple. Reps not used: D Brooker, G Sebastien, A Chesters, R Wedlake. Albion: Tries: Shepherd 2, Stupple, Dacres; Cons: Shepherd 2; Pens: Shepherd 2. Yellow cards: Esher: Garner; Albion: Matavesi.